This is a great, quick and easy mid week supper, perfect served with a toasted baguette. Bring a large saucepan of water to the boil. Add in the spaghetti and cook according to the packet instructions. Place the onion, garlic, coriander, chilli and ginger into a food processor with the tomatoes and the sugar and puree until a coarse consistency has been achieved. Meanwhile heat a large deep sauté pan and quickly pan fry the chicken until it is sealed all over. Season lightly with a little salt and pepper and then add in the slices of courgette and continue to cook for a further few minutes. Next add in the tomato & chilli paste from the food processor together with the natural yogurt. Strain off the pasta and add it to the pot and if you wish you can add the chicken stock if you would like a wetter option. 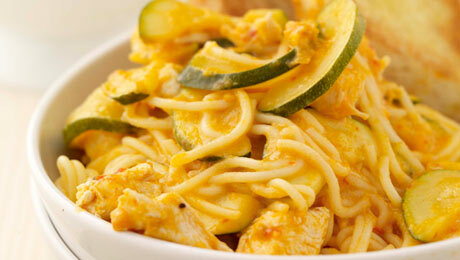 Serve immediately with the Thai style pasta. Garnish with a toasted baguette. Using a sharp knife split the bread lengthways, drizzle with olive oil and pop under the grill for 3-4 minutes until golden brown. This is a beautiful, flavoursome dish. Can't wait to make it again and again..
What is the SuperValu Spice Mix pack? I asked in my nearst supervalu and they never heard of it. Hi Mary, The SuperValu Spice Mix pack contains onion, chilli, ginger, garlic and coriander all of which are used in the recipe. Unfortunately not every store stocks them. Hope that helps!